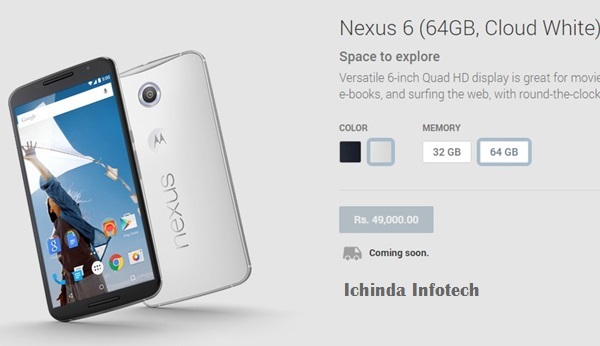 Search Engine Giant, wonderfully crafted your dream smartphone, the all new Google Nexus 6 with Android 5.0 Lollipop soon going to hit India market priced at Rs 44,000 for 32GB and Rs 49,000 for G4GB. which first unveiled on Wednesday, 15th Oct. 2014 going to hit US market from 12th November via Google Play store priced at $649 for 32GB and at $699 for 64GB without Contract and in UK market at £499 for 32GB, £549 for 64GB in in Midnight Blue, Cloud White colour option. 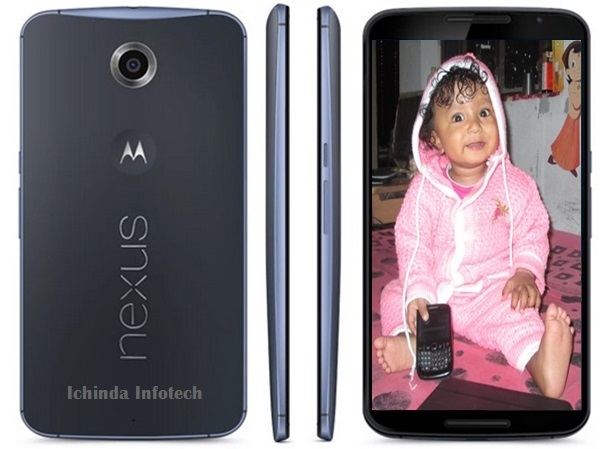 The all new Google Nexus 6 supports Single SIM(GSM), 4G, 3G, Wi-fi, Bluetooth, USB, GPS and NFC runs on world’s most advance operating system Android 5.0 Lollipop which assures you superior software experience extends your device battery life by up to 90 minutes including Easily switch between editing documents, browsing the web, watching movies and listening to music. It’s Dual front-facing speakers provide immersive stereo sound to give you the best audio for movies and games supports 68+ languages(Basque, Bengali, Burmese, Chinese (Hong Kong), Galician, Icelandic, Kannada, Kyrgyz, Macedonian, Malayalam, Marathi, Nepali, Sinhala, Tamil, Telugu), Android TV and a A range of new professional photography(as Capture full resolution frames around 30 fps, Support raw formats like YUV and Bayer RAW, Control capture settings for the sensor, lens, and flash per individual frame, Capture metadata like noise models and optical information) while State of the art video technology with support for HEVC to allow for UHD 4K video playback, tunneled video for high quality video playback on Android TV and improved HLS support for streaming. 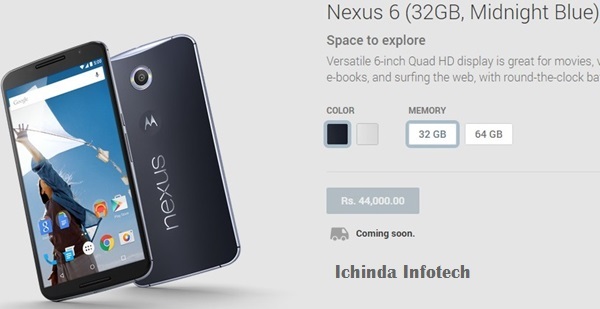 Nexus 6 comes with a bigger and brighter 5.96-inch QHD (1440×2560 pixels) display at 493PPI for playing games and watching movies with stunning clarity powered by a 2.7GHz quad-core Qualcomm Snapdragon 805 processor promising lightning fast multi-tasking with 3GB RAM, 32GB and 64GB internal memory. New Nexus 6 also sporting a An f2.0 lens and 13-megapixel camera with optical image stabilisation capture great photos in daylight and low light. Using advanced computational photography technology and HDR+, the pre-installed Google Camera does the heavy lifting so that you can effortlessly take great photos and 2-MP front camera. Nexus 6 powerful 3220mAh battery offers you up to 6 hours of use from only 15 minutes of charging and over 24 hours of use from a full charge measures 82.98 x 159.26 x 10.06mm and weight only 184gm. 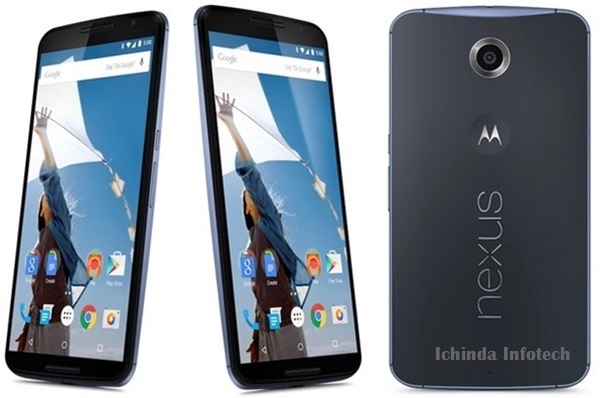 At last few honest word, new Google Nexus 6 is the smartphone of dream coming to change your life. What you think? Please be open to give your view.